PERFECT MAKEUP - Long-wearing sparkle eyeliner lavishes eyes with incredible glitter and shimmer. The 12 colors eyeshadow pencil match your every look, also for different occasions, casual, party, wedding.Buy it as a gift for anyone, perfect for any professional use or personal use. 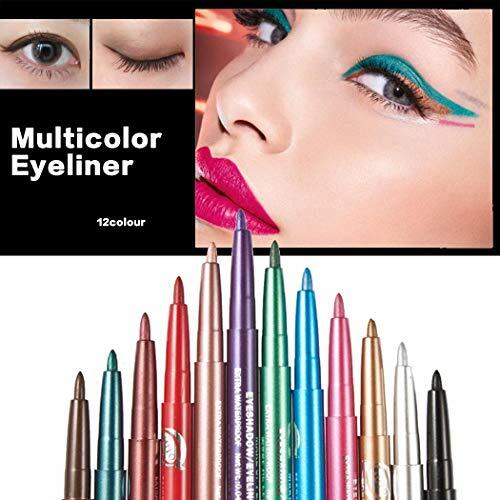 Smooth and creamy eye shadow eyeliner pen that provides vibrant eye color with easy application. no irritating your skin, safe and healthy product. PERFECT MAKEUP - Uniquely lightweight, water-infused texture, it glides on effortlessly, and then dries down smoothly, locking in maximum sparkle with minimal fallout, making you be the eye-catcher in every occasion.